If you feel stuck in work you don't like, it's easy to list all the things that are wrong with your job, isn't it? If you are job hunting, you probably can readily recount everything that has gone wrong or been disappointing. Many of us have a natural bent toward focusing on the negative in any situation. We tend first to see what's bad rather than what is good in a situation. But you know what? Although it may be hard at first, training yourself to see the positive in situations will benefit you (as well as those around you). God wants His people to be characterized by having a thankful, grateful heart despite our circumstances (Col. 2:7; 3:15; 4:2). Developing "an attitude of gratitude" can gradually transform how you see yourself, your life, your work and your potential. It can also transform how people will see you. Recently, our family watched a TED Talk video, featuring Shawn Achor, that reminded us of the power that gratitude can have on our success at work and in life. Shawn is an expert in human potential and believes that intentional thankfulness can lead to dramatically increasing our happiness. We would encourage you to watch his twelve minute TED talk and then try an experiment by doing one of the strategies below for the next 30 days. 1. Start a gratitude journal on paper or your computer. Take a few minutes each morning or evening to write down 3-5 things for which you are grateful. Each day, see if you can come up with at least one thing you are grateful for related to your work. Ask God to help you see what He has given you for which you can express thankfulness. 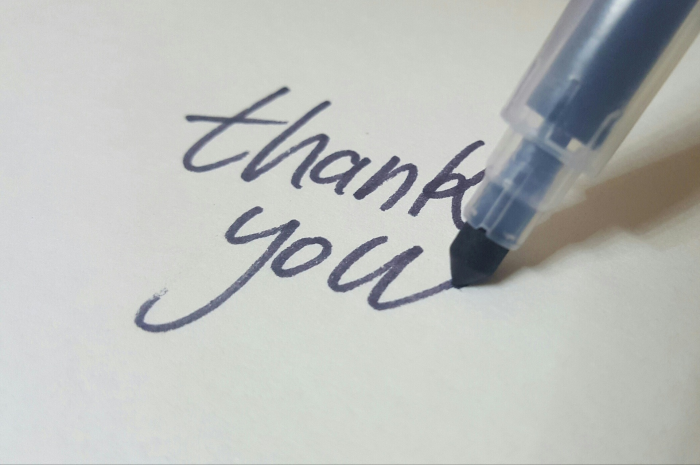 2) Each day, make a point at work (or elsewhere, if you are job hunting) to thank someone for something they have done for you, or to give someone positive feedback about something they do or a character trait or quality that you appreciate in them. Negativity in a work environment is contagious. The opposite can be true, as well! See what impact uplifting comments can make in your workplace. ...The longer I live the more convinced I become that life is 10 percent what happens to us and 90 percent how we respond to it. I believe that the single most significant decision I can make on a day-to-day basis is my choice of attitude.... Attitude keeps me going or cripples my progress. It alone fuels my fire or assaults my hope. When my attitudes are right, there's no barrier too high, no valley too deep, no dream too extreme, no challenge too great for me. Research supports the value of a positive attitude. A 2009 study by the Mayo Clinic found that taking an optimistic approach to the everyday challenges of life leads to better health, peace of mind and a longer life. The optimists in the Mayo surveys had fewer health problems and fewer difficulties with work or daily routines. They experienced less pain, had more energy, were comfortable in social situations and enjoyed social activities. The optimistic study participants also said they were generally happier, calmer and more peaceful than their pessimistic counterparts. Each of us has much to gain from practicing the biblical mandate to "give thanks." For those of us who follow Christ, and want the best out of life, let us remember to make "thanksgiving" a way of life instead of just a one-day celebration! Please comment below and let us know how your thanksgiving strategies are working for you!